Sometimes a little extra support can make all the difference. ... of the traveler whose boiled stone is transformed into a delicious soup through donations of a potato, a carrot, a cabbage from helpful bystanders? This timeless story reminds us that the contributions of many individuals can help us all reach our shared goal. Practitioners who are part of the Stone Soup Project believe that uniting our energies can create a healthier community and a better world. Stone Soup Project envisions a community in which people and animals are living healthy, balanced lives. As a collaborative of natural wellness practitioners, we believe all individuals deserve access to healing services and we volunteer to provide those services. We are committed to ethically providing complementary wellness services and education in partnership with organizations that provide advocacy and education towards improving the health of their target populations. 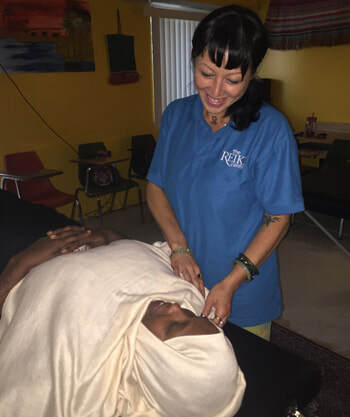 Stone Soup Project (SSP) was created in 2012 by The Reiki Center in Columbus, Ohio to bring increased wellness into the lives of those who are underserved in our community. The Reiki Center is the oldest and largest natural wellness center in Central Ohio. SSP, the nonprofit arm of the organization, is coordinated by a Board of Directors who meet monthly to approve requests from area agencies and direct the activities of our volunteers. SSP’s services are delivered by skilled, trained and vetted volunteers representing a wide range of wellness modalities. Volunteers must demonstrate proficiency, current licensure/certification, and agree to operate within the framework of our standards and code of conduct, as well as agree to a national background check. They offer their time and services on a pro bono basis to benefit those who might not otherwise have access to healing therapies. Volunteers include, but are not limited to, Reiki practitioners, massage therapists, Trager Approach practitioners, CranioSacral therapists, and reflexologists, to name the most available modalities. Additionally, an important service component is our Animal Wellness Program which offers Reiki services to animals who are rescued, abused, fostered, or in need of healing services. This is often done in conjunction with services delivered to their human companions. SSP partners with local nonprofit service agencies which seek to improve the health and well-being of their target populations. The partner agency serves as liaison in the logistics of service delivery, (often in the form of wellness fairs), service selection, and the identification of eligible recipients. Targeted groups we have served include (but are not limited to) rescue animals, pilot dogs, persons with disabilities, individuals with chemical dependencies, trafficked women, institutionalized elderly, caregivers of Alzheimer’s patients, selected health care and hospice staff, veterans, high risk pregnant women, and individuals with mental health concerns. A complete list of all recent activities can be found in SSP’s 2018 Annual Report (click file below). We offer a monthly Children’s Clinic at no cost to participants on the first Saturday morning of every month, also at The Reiki Center. We actively seek joint ventures with agencies interested in obtaining grants and pursuing research in the area of providing wellness services to under-served high-risk populations from a public health frame of reference. If you are an agency that is interested in partnering with the Stone Soup Project to benefit your members, please contact the Project in care of The Reiki Center. If you are an individual unaffiliated with a sponsoring organization and would like to receive wellness services at no cost, please attend our free Reiki Clinic held at The Reiki Center on the third Monday evening of every month. Additionally, we offer a monthly Children’s Clinic at no cost to participants on the first Saturday morning of every month, also at The Reiki Center. The Reiki Center is located at 1540 West Fifth Street, Columbus, in the Grandview area. The #5 COTA bus stops immediately in front of the building. SSP services are offered completely free of charge, but there are program costs associated with organizing and transporting volunteers, as well as marketing our services. Should funds be available, perhaps through a grant or an honorarium, SSP gratefully accepts the sponsoring agency’s support. If you are an individual who would like to receive wellness services, please contact a social service agency to inquire about possible sponsorship.